A good crowed turned out for the first grand final clash. With a lot of noise in the crowd cheering on the Western Wolves. Game starts and Amazon gets the first goal, really putting it up to the wolves and silencing the crowd for a moment or two. The crowd really getting behind the wolves every time they go forward or when a foul is been called against. Struggling to find the back of the net, wolves keep pressing hard and putting the pressure on amazon back three. Amazon go forward on the counter attack and able to score to extend their lead again. Giving them a two nil lead with six mins remaining. With almost no crowd support behind them amazon coach screaming and cheering on her team as they go on to score their third goal for the game. Wolves trying to not fall to far behind late in the first half. Second half the wolves had to keep their heads high and try find away to score and find three goals to level out the game. 3-nil at half time. Melbourne amazons picking up where they left off. Continuing to put pressure on the Western Wolves keeper. Amazon almost were able to go four nil up but the goal was not allowed due to the two touch rule. Giving the wolves a sigh of relief. Melbourne amazon able to find the first goal for the second half and counted. The wolves had a tough fight on their hands. Kristine Farmer (Amazon) finds herself with a open shot on goal, goes on to find her second goal for the match. Western defensive structure really struggling. Their counter attack when able to find the time and space was good just couldn’t convert. A brillant header from Cherryl Rigden give amazon their sixthh goal, After Kristine Farmer’s shot on goal missed and deflected of the side post. One minute later Deidre Burggraaf (Amazon) able score her second to continue to extend their lead, while still leaving western wolves scoreless. The crowd now getting behind the winning team in the Amazons but still getting behind their team and girls in the western wolves. With two minutes remaining amazon again able to find the back of the net. Melbourne amazon get the win 8 nil against the wolves to win the silver cup and end their season on a higher. 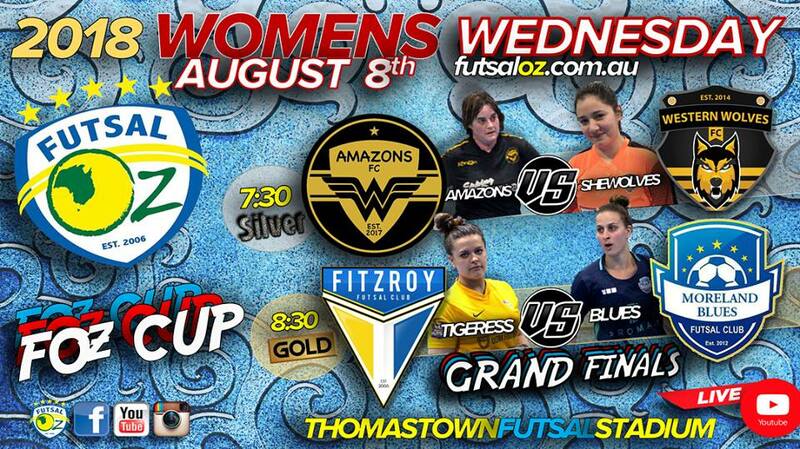 The FOZ grand final is here. Both teams wanting to finish the season with a win and hold that cup high. Fitzroy come out strong and get their first goal for the game. Moreland needed to respond and they did levelling out the game. With the game at dead lock, both teams were kept on their toes and both keepers were kept busy. But it was Moreland with a brilliant tap over two defenders and Fitzroy keeper that saw them get a one goal lead. Both Keepers doing well under pressure blocking shots from everywhere. Both defence struggling when the opposing team is on the counter attack. Turnovers costing both teams when trying to go forward. With 30 seconds to go in the first half. Fitzroy able to find the equalising goal going into half time 2-2. Second half under way and with the game in the balance both teams needed to respond. Fitzroy did exactly that scoring two quick goals giving them some breathing space on the scoreboard. The second half sees a new Fitzroy team attitude. Continuously having shots on goal and defending well as a team. Fitzroy keep seeming to find a way. Scoring their fifth goal with 10 minutes left in the game. Moreland find themselves three goals down and struggling to keep defending and find the motivation to come back and win. Just when they seem to be at their lowest Fitzroy make a silly mistake and Moreland able to score. With six minutes remaining Moreland seem to have found a spark and keep on pushing Fitzroy’s defence and having shots on goal. Due to five fouls to Moreland Fitzroy awarded a penalty shot on goal. Shot missed keeping Moreland in the game with a chance. With three minutes in the game Moreland able to score begging back the lead to finding themselves one goal down. But again due to five fouls rule Fitzroy awarded a penalty shot on goal and this time able to convert. The game ends and Fitzroy are winners.